Todd McFarlane is tired of all the runarounds he’s been getting from Hollywood regarding his Spawn film franchise. It’s been awhile since the first Spawn movie, but McFarlane hasn’t forgotten about his most popular creation. 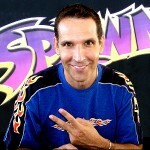 McFarlane has never been shy about his Spawn 2 plans. Last year he announced he was working on a ‘darker, grittier, scarier’ script for the next Spawn movie. Apparently three smaller Hollywood studios are interested in the project, but McFarlane wasn’t naming any names. McFarlane spoke to Newsarama about his Spawn 2 plan while in New York City recently to promote his McFarlane Toys 2010 product line at Toy Fair.